According to my handy-dandy calendar, today is officially the first day of Autumn, but the trees are still quite green here in Southern California and the weather, still warm. Much like the Native American willing rain with a dance, I was hoping to summon chilly weather by listening to Christmas music. I may have had a bit of an effect as the weather has cooled off a bit, but not enough to justify sweaters and scarves. Actually, to be completely honest with you, I will admit it is the baking I miss, not so much the scarves. Last night, I stayed up late and watched The Blacklist with my parents. Those action-packed FBI shows really get me, even though my slow Evening Brain misses some of the quick-talk dialogue. There was some mumbling about chocolate brown Zegna ties having a thread woven into the fabric that actually functioned as a homing device. What this little fun fact had to do with the main topic of conversation which centered on the search for some villain, I have no idea! By the time the show was over, it was way past my bedtime. So I grabbed a cup of tea and a good (cook)book, bid my folks sweet dreams and settled down for some light reading. At the top of Andrea’s picks for September’s Cottage Cooking Club features was Hugh’s pinto chili. I do not know that I read through the rest of the choices. Not even the hot weather outside could change my mind. Or could it be that I was somehow trying to change the weather by cooking something meant for a cold and windy night’s supper? Whatever the case, this chili had to be good. The picture looked good. The ingredients were fresh and simple. After we had dinner and my li’l sweetheart got a bath, bedtime stories and finally fell asleep, I went back into the kitchen and whipped this up. It was just that easy. There is one ingredient that is quite unexpected. Chili is, after all, an authentically American dish. Originally, chili was very simple, made of meat, chili peppers and salt, all bashed together and dried into brick shapes. Cowboys would take these with them on cattle drives. At the end of the day, they would set up camp, boil the bricks in a pot over a fire and reconstitute them back into a stew. Did you know that? Hugh’s recipe is just so easy. There is one ingredient that was a bit of a shocker: Red wine. Hugh is a Brit with something of a varied and refined taste. I doubt that the tough cowboy had any wine handy out on the trail to use for spiking his chili. But, times are a-changin’ and it is very healthy to bend the rules a bit. I followed his recipe faithfully, so you know that red wine went into my pot. It sat on a very low flame for the rest of the night, bubbling and gurgling slowly like a tame lava pool. This is the sort of meal you want to make ahead of time. As the clock ticks on, something magical happens and the chili tastes even better the next day. There was one little addition I made to the original recipe: The luxurious toppings. No, the cowboys did not have sour cream, avocados, limes, cheese and coriander, but, count yer blessin’s, Darlin’, bahcawse we sure DO. I want the weather to cool immediately, have a roaring fire in the fireplace and have THIS for dinner. YUM. Your chili looks lovely. Happy you enjoyed! One thing the old cowboys did use in their chili was some leftover coffee brew from the day which does add a depth of dimension. Thanks for sharing. Scratching my head as I was disappointed with the Chili but yours looks (and sounds) amazing. 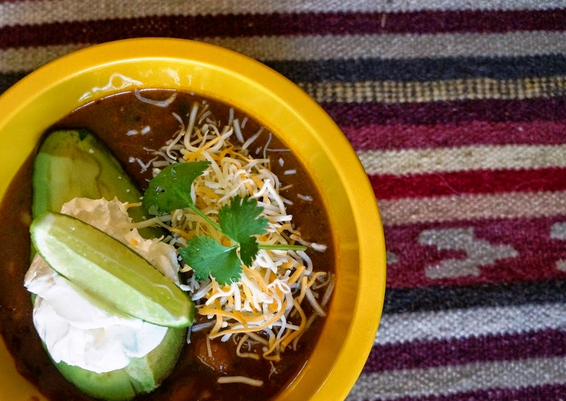 Love avocado but never thought to add half of one to chili, looks delicious! I had no idea about the chili “bricks” – love that! Your chili looks delicious, especially with the lovely garnishes.We enjoyed it as well and thought the wine was a very nice addition. Hi Coco, did not realize that red wine was one of the ingredients for this dish, looks wonderful. Love the toppings that you added. Great idea! Colette, looks like you enjoyed a wonderful meal of vegetarian chili – so good to read that you liked the River Cottage version (with the addition of the red wine, of course).Thank you for participating again this month! Always such a pleasure to cook along with you! Colette, your toppings look fabulous! 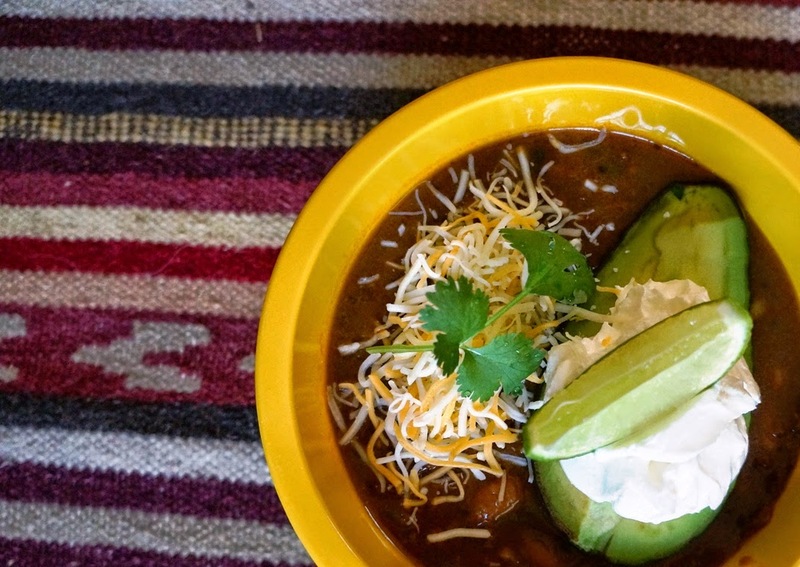 As good as this chili was, I do have two other recipes I prefer – and both use wine! Thanks for the history lesson, I did not know about the chili “bricks”. A fun fact, to say the least. Just for the toppings alone, I would make this chili YOUR way. Agreed that the warm southern California weather probably did not cater to this delicious old standby but am glad you made it. It snowed in Aspen this past week so it would have been perfect for me. I have a Vegetarian in my family so will try this out on her. Nice job, Coco. Your photo of that chili makes me want to have some right now! The avocado, sour cream and lime look like they would really be amazing with your chili. I couldn't face chili yet at this time of year, it's too hot, but that looks terrific, and would be wonderful to try! This was a favourite for us, too! Love all your beautiful photos.